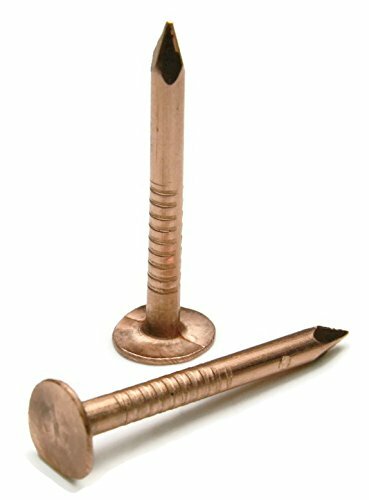 Copper Roofing Nails are used in various roof installations, notably in slate roofs for their ease of removal if the slate needs to be replaced as well as their corrosion resistance and malleability. They are also used for straps, gutters, and leaders as part of rain gutter systems, fascia installations, furniture restoration, and planked wooden boat construction. While designed for roofing, copper nails have other uses as well such as flashing and decorative finishing applications. Copper roofing nails feature wide, flat heads for an increased bearing surface with diamond points and smooth shanks for ease of penetration. They are made entirely of solid copper and their corrosion resistance and malleability make them a good alternative to galvanized nails.